I completely love Dropbox. It has literally changed how I work and manage my project files between my computers. 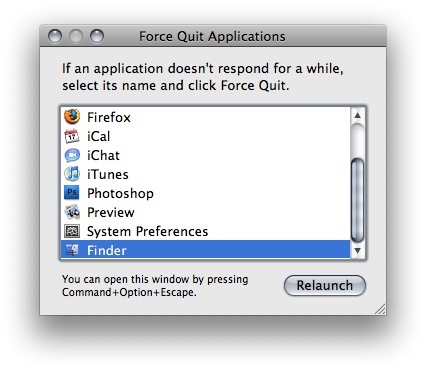 There has been a thorn in the side of this system for a while though, at least in OS X. 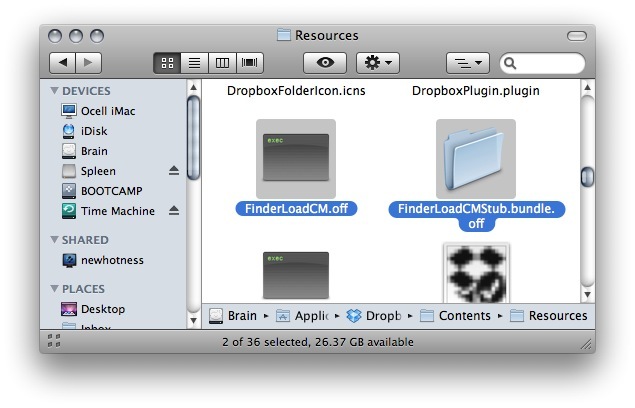 The icons Dropbox overlays on your file thumbnails to let you know which files are syncing, synced, and excluded from syncing are useful, but they rob the system of the ability to give you preview thumbnails. For instance, take the graphic below of a folder of JPEGs in Dropbox. Instead of a preview of each graphic, you get a blank document icon with a green checkbox. I’ve been making extensive use of “Quick Look” (one of my favorite features brought to the table by Leopard) and the Coverflow folder view to get around this. Unfortunately, it’s still added clicks and keystrokes that just add friction to my workflow. So I’d really like to get rid of these icons and get my previews back. Sure, you lose the ability to see which individual files are syncing, but you can still watch the menu bar icon for Dropbox to see when things are done syncing. If you have Growl notifications enabled, that will be another indication. I think it’s very possible to live without the status icons on each file. I hope that the Dropbox team will add an option in preferences to disable these status icons and allow for preview thumbnails, there are several requests in the forums for such an option. Thankfully, while digging through the forums for an answer to the problem I came across this thread that lead me to the right files to delete, and now I have my preview icons back! What follows is a quick guide to doing it on your own system. 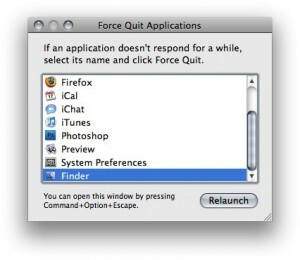 Hit “âŒ˜ option esc” select Finder and choose relaunch. This will clear out the icon Dropbox plugin that’s already loaded in the system. 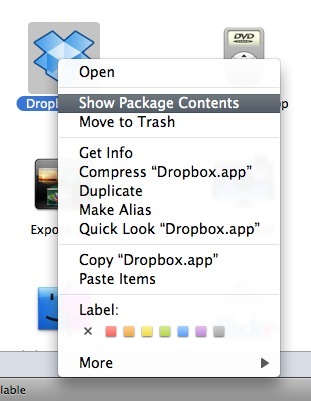 Launch Dropbox and you should now have preview icons for files in your Dropbox folder! I need to admit ignorance about what exactly is happening here. I THINK you need to rename both of those files, when I just renamed FinderLoadCM things didn’t work. If you know of a more reasonable way to accomplish this, please share in the comments. I hope this helps a few people out there! 2. Opened the png in photoshop, deleted the contents, saved it. 3. Uploaded to http://www.eisbox.net/iconvert/ and downloaded the .icns file and replaced the original file with this new one. 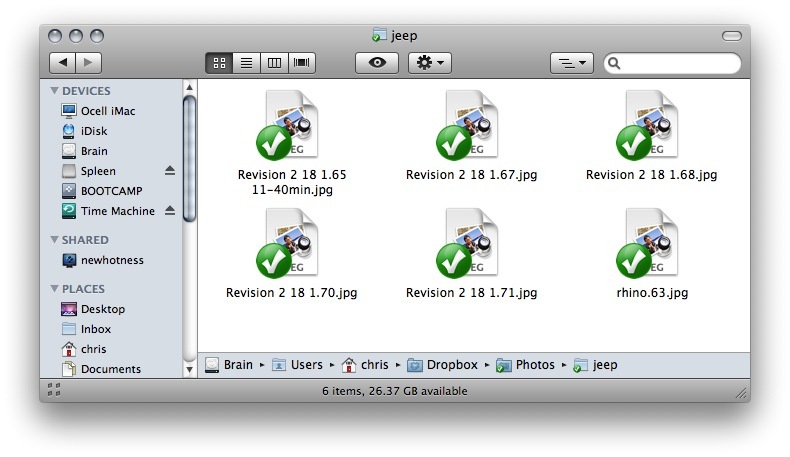 The result: I have the blue icons for unsynced files, but once synced the original icons appear restored. I hate that my method didn’t work, but I like your solution a lot. It’s even more functional. Thanks for sharing it! I use Dropbox as a place for my inspiration-folder (so I can acccess it at both work and home), and this was important for it’s use. 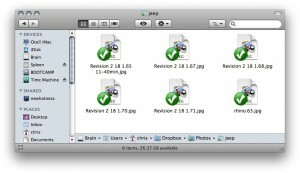 Ciaran’s way is too complex, but you forgot to mention one thing, you must restart Finder to see previews.